Hall of Fame during the NFF Dinner on Dec. 5 in New York. DALLAS – It was another wild weekend in college football with so many highly-ranked teams facing stiff competition. Week 9 delivered one of the most anticipated matchups of the season and it did not disappoint, as the Ohio State Buckeyes won a thriller in Columbus to take the driver’s seat in the Big Ten and move up to the No. 1 spot in the Fan Plan Championship Index. The Buckeyes now have a 79.09% chance to make it to the national championship game, according to the FPCI. Ohio State moved up from its No. 5 spot a week ago after its come-from-behind win over previously No. 2 Penn State. The Nittany Lions dropped to No. 7 in this week’s ratings with a 2.68% chance to make the championship game. Georgia, despite its dominant win over rival Florida in Jacksonville, FL, moved down one spot to make room for the Buckeyes. The No. 2 Bulldogs sport a 42.22% chance to play in the national championship game, followed by fellow SEC member Alabama, which comes in at No. 3 with a 34.78% chance to play in the national championship game. The remainder of this week’s FPCI Top 10 includes No. 4 Clemson (13.52), No. 5 Oklahoma (13.33%) No. 6 Wisconsin (10.94%). No. 7 Penn State (2.68%), No. 8 Notre Dame (0.97%), No. 9 Miami (0.88%), and No. 10 Virginia Tech (0.73%). ONE DOMINO FALLS: The first big domino in the chase for the playoffs fell last weekend when Ohio State took control of the Big Ten with a 39-35 win over Penn State. Despite Penn State’s No. 2 ranking entering the game, the FPCI proved correct as it predicted a close Ohio State win by the score of 31-26. Ohio State is now clearly in the driver’s seat in the conference, especially in the Big Ten’s East Division. The Buckeyes avoided a potentially-hairy night game at Kinnick Stadium in Iowa City, as the schedule makers chose for a 3:30 pm kickoff instead of a primetime affair. Ohio State then closes out the regular season with home games against Michigan State, a loser to Northwester a week ago, and Illinois before the season finale at Michigan. According to the FPCI, the Buckeyes should breeze through those final four games, as their lowest projected win percentage is 85% against both Iowa and Michigan. The FPCI gives OSU a greater than 90% chance to win the other home games. Should Ohio State run the table the rest of the way, there is no way Penn State can catch them. Ohio State’s lone loss came in a non-conference game against Oklahoma. Ohio State’s remaining schedule makes it difficult to see where the Buckeyes might slip up, so Penn State’s best chances to get into the playoffs likely come with a Wisconsin win over Ohio State in the Big Ten Championship Game. That would force the committee to decide whether to take an undefeated Wisconsin squad that won the conference championship or a one-loss Penn State team that dominated the regular season save for the final two minutes in Columbus. Last year the committee opted not to take the winner of the championship game, which happened to be Penn State. Would they do the same this season under a similar scenario and take the Nittany Lions? That’s a discussion for another day, because the odds-on favorite now to win the Big Ten is Ohio State. The FPCI projects a 32-19 win for the Buckeyes over Wisconsin in a potential match-up in the conference championship game, leaving a one-loss Ohio State team as a conference champion to add to the mix for the selection committee. OTHER DOMINOS TO FALL THIS WEEKEND: When looking at the schedule, there are a number of enticing matchups that will have playoff implications, with two conferences in particular – the ACC and the Big 12 — that will begin to sort things out in ultimately determining who will make the case to represent those conferences in the playoff field. In the ACC, two contenders will see their national championship dreams fade away as the top two teams in the Atlantic Division go against each other and the top two teams in the Coastal Division also face off. These games will essentially serve as divisional championship games, with the winners very likely battling in the ACC Championship Game in December. The first matchup of the day occurs in Raleigh where the No. 4 Clemson Tigers travel to face the North Carolina State Wolfpack in a matchup for control of the Atlantic Division. The Wolfpack were a FPCI Top 10 team last week before falling at Notre Dame. However, they still have conference championship aspirations, but will have to take down the Tigers in order for those hopes to continue on. The FPCI gives the Tigers a 73% chance to win. Then later Saturday night the Coastal Division is up for grabs when No. 10 Virginia Tech heads to Coral Gables to face No. 9 Miami. Miami remains undefeated on the season, one of just five such teams, but Virginia Tech has been solid throughout, losing only to Clemson. The FPCI believes in the Hokies, despite being on the road, and gives them a 63% chance to win the game, with a projected final score of 25-19. In the Big 12, the league’s attention turns to Stillwater as Oklahoma travels to Oklahoma State. The No. 5 Sooners got a huge boost with the Ohio State win over Penn State, moving up from No. 9 a week ago. Oklahoma currently has a 13.33% chance to make the national championship game according to the FPCI. If both Oklahoma and Ohio State can run the table and finish the season as one-loss conference champions, it will be difficult not to take the Sooners over the Buckeyes after Oklahoma’s dominant 31-16 win in Columbus earlier in the season. But don’t count the Cowboys out. Oklahoma’s defense has been porous at times, and even though the Cowboys have also had their offensive struggles at certain points in games this year, they just hung 50 at West Virginia. And don’t look now, but the FPCI is actually calling for the Oklahoma State win, giving the Cowboys a 56% chance to win the game and projecting a final score of 42-39. Following TCU’s loss last weekend to fall from the ranks of the undefeated, an Oklahoma loss this weekend would further water down the conference’s quest for a playoff birth. UNBEATEN NO MORE: The pool of undefeated teams was nearly cut in half last weekend, severely damaging the playoff hopes of a couple of those now one-loss teams and officially eliminating another that never really stood a chance. Let’s get to that one first, as USF suffered a late loss against Houston. That officially put an end to their quest for an undefeated season and officially eliminated them as a playoff contender, though the Bulls were never really on the radar. There is now only one undefeated non-Power 5 team still standing, and that is UCF. Aside from USF, the other losses, however, really hurt. Penn State was a lock for the playoffs if it could run the table, and for the first 58 minutes of its game at Ohio State, those playoff aspirations seemed to be right on track. But a failure to stop JT Barrett in the fourth quarter, and the Nittany Lions’ own inability to move the football late in the game, dashed any thoughts of an undefeated season. Now they will likely have to count on getting a bid without being a conference champion or even a divisional champion. The way this season is playing out, that is appearing less and less of an option. And finally in Ames, Kenny Hill made some crucial turnovers and never could get the TCU offense going as the Horned Frogs became the final Big 12 team to lose a game this season. That’s huge, because it markedly lowers the Big 12’s chance of a playoff spot. Oklahoma now seems like the conference’s only chance, as it sports a huge win at Ohio State. Had TCU run the table and won the conference as an undefeated team, there’s no doubt it would have been in the playoffs. However, with so many one-loss teams across the country and the fact that the Big 12 is currently ranked No. 6 among conferences by the FPCI, it’s difficult to imagine a Big 12 team not named Oklahoma getting into the field this season, and the Sooners still have games against Oklahoma State and TCU, then a conference championship game that will likely be a rematch against one of those two foes or Iowa State. That’s a tough task for a conference that knows how it feels to be left out in December. CAN THE UNBEATENS REMAIN THAT WAY? : This week we enter the schedule of games with five undefeated teams left. As we did above, we can get rid of one of them from the conversation, as the UCF Golden Knights, no matter what they do, will not have enough clout, or an impressive enough resume, to warrant playoff consideration with so many quality one-loss teams that should be in the mix. So that brings us to four teams – Georgia and Alabama from the SEC, Miami, and Wisconsin. Undoubtedly Wisconsin has the easiest trek through the regular season. The Badgers are significant favorites against all remaining regular season foes – Indiana, Iowa, Michigan, and Minnesota. Even if Wisconsin were to lose one of those games, the Badgers would still play in the Big Ten Championship Game. Their true test will come there, where a win to become an undefeated conference champion will certainly get them into the playoff field. As previously stated, Miami is on alert for their first loss of the season this weekend. The FPCI has Virginia Tech traveling to south Florida and coming away with a win. If that happens, Miami can forget about any potential playoff chances. The Hurricanes also still have a regular-season game against Notre Dame, a game in which the FPCI also projects the Hurricanes to lose. And, if somehow they got past Virginia Tech and Notre Dame, the FPCI still projects the Hurricanes to lose potential ACC Championship Game matchups against either Clemson (by two touchdowns) or North Carolina State (by one point). The other two undefeated teams reside in the SEC. Both Alabama and Georgia, ranked Nos. 2 and 3 respectively in this week’s FPCI rantings, appear to be on a collision course for the SEC Championship Game. The key is whether both will arrive in Atlanta undefeated. Alabama has a bit tougher road, starting with LSU at home this weekend, then followed by games at Mississippi State, vs Mercer, and at Auburn to end the regular season. The Crimson Tide is favored in every game, with the closest FPCI projection a 26-17 win over Auburn. Georgia also plays at Auburn, where the Bulldogs are projected to win 22-18 in a close contest. Their other remaining regular opponents are against South Carolina and Kentucky and at Georgia Tech to close the regular season, so if they can get past the border rival against Auburn, Georgia’s path to perfection seems pretty clear. TWO FOR THE SHOW: Should both Alabama and Georgia both advance to the SEC Championship Game undefeated and each have a good showing there (i.e. neither gets blown out), it will be difficult to leave either out of the playoff field. If Alabama wins the SEC Championship Game, Georgia will have had a quality out-of-conference win on the road at Notre Dame, plus wins over Auburn, Mississippi State, and the rest of its SEC foes, and will likely be one of only three Power 5 teams to go undefeated in the regular season (assuming Miami loses along the way and Wisconsin wins out). This year, with the remaining field to choose from, that probably gets it done, unless the Selection Committee simply insists that all participants be conference champions no matter what. Similar to Georgia, Alabama would likely be in the playoff field if it can run the table in the regular season. Barring a huge loss in the SEC Championship Game, many of the arguments for the Bulldogs can also be made for the Crimson Tide. 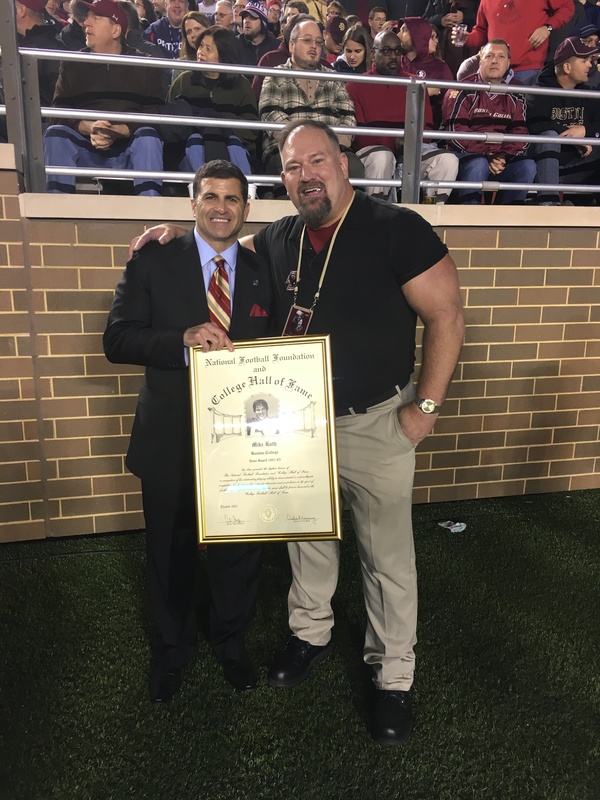 Alabama beat Florida State when the Seminoles had all of their starters in place, and that game was never really in doubt even when Deondre Francois was healthy and running the FSU offense. The Crimson Tide will also have been at or near the top of every poll and power ranking formula there is throughout the entirety of the regular season. Under this scenario, the undefeated SEC champion definitely gets in as the No. 1 overall seed. The question then becomes does the losing team that finished with an undefeated regular season record also get into the playoff field? If that loser is Alabama, it’s probably pretty automatic, given the Crimson Tide’s dominance throughout the season and its recent history. If it’s Georgia, you would have to put the Bulldogs in over an 11-1 Notre Dame team, given they gave Notre Dame that one loss. Georgia would go in ahead of the Pac-12 champion, which may well have two losses. Now you’re left with the Big Ten and Big 12 champs. We will assume Ohio State will be the Big Ten champion with just one loss. If the Big 12 champion is a one-loss Oklahoma team, the Bulldogs may well be left out, as arguments could be made that Oklahoma must go in ahead of Ohio State because of the head-to-head win and the overall power of the Big Ten deserves to get its conference champion into the playoff field. However, if the champion of the Big 12 is any team other than a one-loss Oklahoma squad, it will very likely happen that the SEC becomes the first conference to get two teams into the playoff field should both Alabama and Georgia win out and arrive at the SEC Championship Game undefeated. 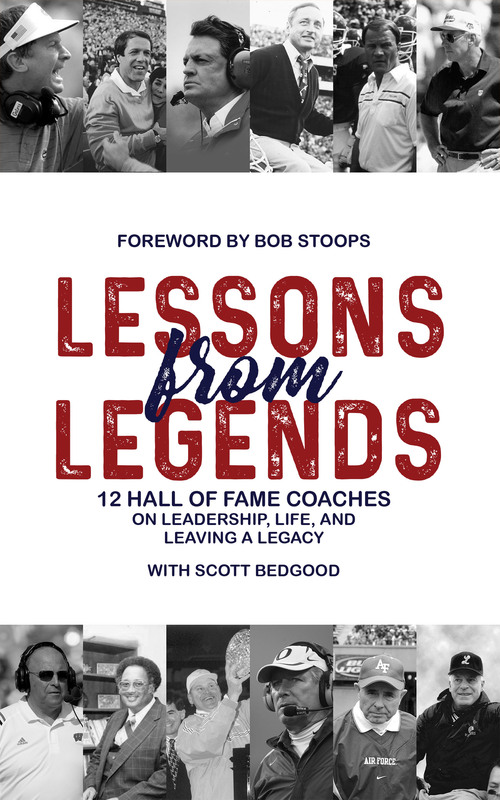 IRVING, Texas – The National Football Foundation (NFF) & College Football Hall of Fame proudly announces the release of their exciting new book, Lessons from Legends: 12 Hall of Fame Coaches on Leadership, Life, and Leaving a Legacy. The book is available now and can be purchased by clicking here. Lessons from Legends may be the greatest collection of college football knowledge ever assembled. With over 260 years, 2,100 wins, 95 conference titles and 13 National Championships of combined coaching experience, any football fan, coach or player can learn from the wealth of wisdom contained in these pages. The book features Q&As with 12 College Football Hall of Fame coaches as they discuss their careers, the lessons they learned and specific features or topics that marked their careers. Tom Osborne and Barry Switzer won year after year. Barry Alvarez turned Wisconsin into a perennial winner. R.C. Slocum treated players the right way. Terry Donahue kept his players from distractions in Los Angeles. Steve Spurrier did things as only Steve Spurrier could. These lessons and more from Mike Bellotti, Marino Casem, Fisher DeBerry, Vince Dooley, Phillip Fulmer and Frank Girardi are featured in the book. With quotes from College Football Hall of Famers Troy Aikman, Peyton Manning and Danny Wuerffel, and from Washington head coach Chris Petersen, this book has an unmatched combination of football talent. 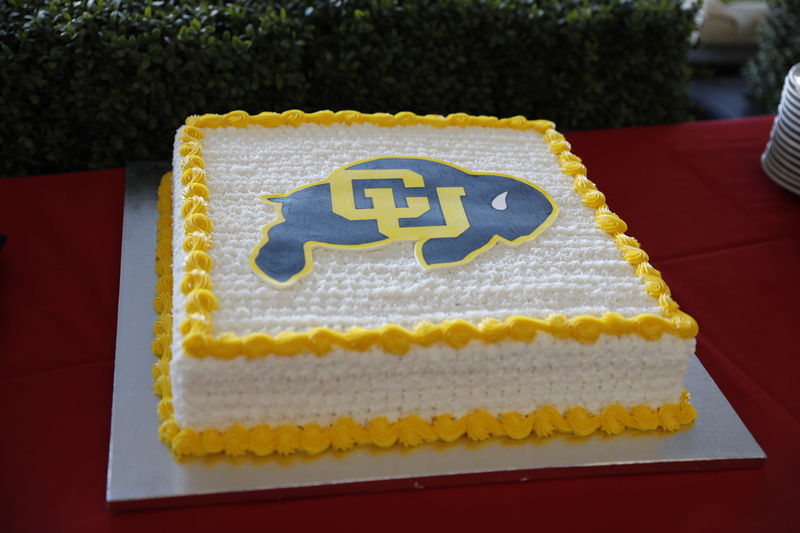 “I was a part of Coach DeBerry’s first freshmen class when he got the head coaching job at the Air Force Academy. From Day One you could tell he was a man of purpose and passion. He was the ideal person for the unique and challenging position as a coach at a service academy. “It was an honor and privilege to play for Coach Fulmer. From the first time I met him in December of 1993, when he came to my home, I felt very comfortable talking to him. A significant part of my decision to stay my fourth year was because I wanted to play for Coach Fulmer another year. I learned a lot about football from Coach Fulmer; he had great insight into all phases of the game. Scott Bedgood has interviewed Hall of Famers, Emmy and Grammy award winners, Guinness World Record Holders, adventurers, and entrepreneurs in his journalism career. A sportswriter since he was 15-years-old working for the Tyler Morning Telegraph in Tyler, Texas, Bedgood attended the University of Oklahoma where his passion for college football compelled him to pursue a career covering the sport. Scott began covering college football after graduating and moving to Dallas where he lives with his wife Samantha. His other work can be found on his website www.scottbedgood.com. Bedgood can be reached at scott@archervision.com. Founded in 1947 with early leadership from General Douglas MacArthur, legendary Army coach Earl “Red” Blaik and immortal journalist Grantland Rice, The National Football Foundation & College Hall of Fame is a non-profit educational organization that runs programs designed to use the power of amateur football in developing scholarship, citizenship and athletic achievement in young people. With 120 chapters and 12,000 members nationwide, NFF programs include FootballMatters.org, the College Football Hall of Fame in Atlanta, The William V. Campbell Trophy presented by Fidelity Investments, annual scholarships of more than $1.3 million and a series of initiatives to honor the legends of the past and inspire the leaders of the future. NFF corporate partners include Delta Air Lines, Fidelity Investments, Herff Jones, New York Athletic Club, Pasadena Tournament of Roses, PrimeSport, the Sports Business Journal, Under Armour and VICIS. Learn more at www.footballfoundation.org. DALLAS — For the second week in a row turmoil atop college football has sent playoff contenders reeling. As a result, the Fan Plan Championship Index was once again reshuffled, leaving a familiar team back at the top of the standings in the race to determine which teams will be playing for the national championship this season. A week after two of the FPCI’s Top 5 teams were beaten, this past weekend saw four of the Top 10 FPCI teams go down, including the top two teams on a wild Friday night of action. Thanks to Clemson’s loss at Syracuse and Washington State’s loss at Cal, the Alabama Crimson Tide have vaulted all the way back to the No. 1 overall spot from last week’s No. 8 position. The Crimson Tide now have a 46.08% chance to make the national championship game, a jump of more than 38 percentage points and the largest jump of any team. Alabama is followed by SEC rival Georgia, which moved up from No. 4 to No. 2. Georgia’s 44.15% chance to make the national championship game is up more than 23 percentage points from a week ago. No. 3 Penn State (33.00%) and No. 4 Miami (24.22%) round out the Top 4 in the projected playoff field. Ohio State (19.59%), which is chasing Penn State for Big Ten supremacy, comes in just outside of the Top 4 at No. 5 overall. This week’s Top 10 is rounded out by No. 6 Notre Dame (19.14%). No. 7 North Carolina State (4.64%), No. 8 Michigan State (3.80%), No. 9 Clemson (1.73%), and No. 10 USC (1.13%). WELCOME BACK TO THE TOP, BUT WHEN WILL THE TIDE BE TESTED? : After sitting atop the Fan Plan Championship Index for three weeks and then giving way to other contenders for a month, the Alabama Crimson Tide have returned to the No. 1 spot atop the FPCI ratings. This week’s FPCI has Alabama with a 46.08% chance to play in the national championship game, a huge jump of more than 38 percentage points from a week ago when the Tide were at No. 8 in the FPCI rankings. There’s no doubt that Alabama has been the most steady of the dominant teams in the country this season. The average score of an Alabama game this season has been 43-10. Alabama’s closest game was a 27-19 contest against Texas A&M a couple weeks ago, but the Tide were up 24-3 early in the third quarter in College Station. Was that final result more a matter of Alabama losing focus, or was it a chink in the armor? That’s still to be determined, but last weekend the Crimson Tide shut down any thoughts of an upset when Damian Williams took the first play of the game for a 75-yard touchdown en route to a 41-9 win over Arkansas. According to the FPCI, Alabama is heavily favored to win its remaining regular season games, most of which the Tide have a greater than 90% chance to win. The lowest remaining percentage is at Auburn in the regular season finale, but even then Alabama currently has an 81% chance to win that game. If the season unfolds the way it’s currently going, this could be a historically easy path to the SEC championship, a conference that has prided itself with having huge slates of top teams through the recent decades. Currently Alabama has only played one game against an FPCI-ranked team at the time of the game – that was Week 1 against then- No. 4 Florida State. Alabama’s FPCI average opponent rank is 67.3 and Alabama’s opponents’ combined record is 24-20. Looking forward it doesn’t get much better, as the only remaining team on the Tide’s schedule ranked in the FPCI is Auburn at No. 16. Alabama, which is ranked No. 2 in this week’s FPCI power rankings, would also be favored in a potential SEC Championship Game match-up against No. 2 Georgia, with the FPCI simulations projecting a 25-14 Alabama win in that matchup. But all of that is on paper, and as the past two weekends in college football have proven, you really don’t know what to expect until a team finds itself in the fire. But for Alabama, it seems like that may not come before December, at the earliest. CHAOS ABOUNDS, PART 2: Two weekends ago it was two FPCI Top 5 teams that went down and caused a huge shake-up in the FPCI ratings. But that was nothing compared to this past weekend when four FPCI Top 10 teams lost, including the No. 1 and No. 2 ranked teams in the land. When all of the dust cleared during what was supposed to be a ho-hum weekend on the schedule, the ruins that were left made it clear that we’re no closer to defining the playoff field than we were when we started the season. Clemson Tigers: Friday night’s falterings by No. 1 Clemson and No. 2 Washington State sent shockwaves through college football. Clemson had finally made its way to the No. 1 overall spot in the FPCI with a projected 50.24% chance to make the national championship game. It also had the best resume of any of the contenders with wins over three teams that were highly ranked when they faced the Tigers in Auburn, Louisville, and Virginia Tech, all three of which the Tigers summarily dismissed. But Friday night Clemson fell to a gutsy, if only average, Syracuse team and in the process lost its quarterback to a concussion. That marked the second consecutive questionable final score, as the week before some concern centered around the Clemson offense in a pedestrian 28-14 win over Wake Forest. This isn’t the same Clemson team as last season and the Tigers’ ability to lose focus – both by the players and the play callers (see Dabo Swinney’s refusal to just pound the ball down Syracuse’s throat) – is a little concerning. However, Clemson still appears to be the class of the conference and it might take more than one loss to keep them away from the playoff field. Washington State: Yes, the Mike Leach offense is fun to watch when it’s clicking on all cylinders. And yes, it appears Washington State has a defense that’s better than anything Pullman has seen in the Mike Leach era. But yes, it’s still the same Mike Leach system that’s too prone to lay too many eggs at crucial times to trust that the Cougars are ready to run the table and claim the Pac-12 title with just one loss. The FPCI has Washington State at No. 11 overall with a 0.89% chance to play in the national championship game, and that’s probably much more realistic than last week’s No. 2 overall ranking following its huge victory over USC. The FPCI is projecting two more losses this regular season, one against Stanford and one at Washington. It’s also possible that the wheels could come off entirely, as Washington State only has a 54% chance to beat Arizona in Tucson and a 55% chance to win at Utah, both of which could be considered tossups at the moment. Washington: What an implosion in the Pacific Northwest this weekend. Following Washington State’s Friday night loss, the Washington Huskies had its chance to take control of the Pac-12 North. But as bad as Washington State looked on Friday, Washington wasn’t any better on Saturday in its 13-7 loss at Arizona State. Washington, last season’s playoff representative from the Pac-12, is still winless in Tempe since 2001. Arizona State previously allowed 30 or more points in 11 straight games and Washington entered the game averaging 43 points per game, but failed to find the endzone until the fourth quarter, going nearly 50 minutes without scoring. It still may be Washington or bust as far as the Pac-12’s playoff chances go, especially if USC falls to Notre Dame this week. The FPCI, which has Washington at No. 18 this week and a 0.05% chance to play in the national championship game, has Washington favored to win all of its remaining regular season games, which includes a road trip to Stanford. In that game the Huskies have a 55% chance to win with a projected score of 25-23. That would likely lead to a Pac-12 Championship Game rematch against USC, which the FPCI currently has as a 26-19 Washington win. Auburn: The fourth FPCI Top 10 team to fall was Auburn, which was stunned by LSU after going on top 20-0 and seemingly headed to another route of an SEC West foe. In its three previous games, Auburn had beaten Missouri 51-14, Mississippi State 49-10, and Ole Miss 44-23, so the 20-0 start appeared to be just more of the same. But the home-standing Tigers turned the defensive tables on Auburn, which finished with just 65 total yards in the second half. They may have also provided the blueprint for stopping Gus Malzahn’s offense, a feat only Clemson had been able to approach this season. With both Georgia and Alabama left on the schedule, along with a tricky game at Texas A&M, this playoff dark horse a week ago now can seemingly only be a spoiler. But don’t be surprised if Auburn does take down one of the two SEC giants. The Alabama game is in Auburn this season, just a few years removed from the Kick Six in Jordan-Hare. This season of chaos is going a little too smoothly atop the SEC – so smooth that it now appears the SEC could get two teams into the playoffs if the right dominos fall –which is why an Auburn upset of Georgia or Alabama seems like a heck of a pick as the regular season winds to a close. BEST CHANCE FOR A TWO-LOSS TEAM: While it’s still a longshot that a two-loss team will advance into a four-team playoff field, the odds of that happening continue to get shorter the more the top teams continue to lose. So does a two-loss team really have a shot at making the playoffs? Possibly, and if so, Stanford seems like the odds on favor. First and foremost, the Cardinal would have to win the Pac-12 Conference. As much of a stretch as it seems when discussing a two-loss team in the playoffs, it’s pretty much a lock that any two-loss team would have to be a conference champion to even be considered, and at this time Stanford seems like the two-loss team that’s in the best position to accomplish that feat. The Cardinal began the 2017 campaign on a sour note. After beating Rice in the season opener, Stanford fell to USC 42-24 and to San Diego State 20-17 before righting the ship. One early-season loss can be overcome, especially when it’s to a team the caliber of USC. But that slip-up against the Aztecs was a dagger for a Stanford team that knows a lot about early season losses. In 2015, Stanford lost out of the gates to Northwestern, only to reel off eight straight wins to climb up to No. 7 in the rankings. But a 38-36 home loss to Oregon ended any hopes of the Cardinal advancing to the playoffs. Instead, Stanford trounced No. 5 Iowa in the Rose Bowl, 45-16. Stanford also dropped two early-season games in 2012 against Washington and Notre Dame before rallying to finish in the Top 10. In both seasons early season setbacks seemed too much to overcome, despite those Stanford teams finishing the year as good as anyone in the country. That could happen again this year as the Cardinal are now surging after the two early-season losses. Stanford is 5-2 and winners of four in a row. The FPCI gives Stanford a 0.64% chance to make the playoff field. Stanford’s schedule down the stretch is tough, including games against No. 11 Washington State, No. 18 Washington, and No. 6 Notre Dame. The FPCI projects Stanford to still lose two of its remaining games, but by a combined three points. Essentially the game against Washington and the game against Notre Dame, both home games, are both toss-ups. If Stanford can traverse that regular season slate successfully and then win the Pac-12 Championship Game, it would mean 10 straight wins for the Cardinal to close out the season and a conference championship. With the Pac-12 currently listed as the second strongest conference in America, it’s conceivable to believe that a 10-2 Stanford team that has won 10 straight games could get in ahead of an 11-1 team from the Big 12, especially if that team is TCU and it were to go into the Big 12 Championship Game undefeated but lose to a 2-loss or 3-loss team. WHAT ABOUT THE AMERICAN ATHLETIC? : Not only do all of the losses by supposed playoff contenders make for exciting weekends of action, but they also help keep alive the hopes of the undefeated non-Power 5 teams still lurking. Specifically, for UCF and USF of the American Athletic Conference, with every loss by a Power 5 heavyweight comes a bigger smile and more hope. But the FPCI doesn’t exactly see it that way. The UCF Golden Knights and USF Bulls are both ranked No. 21 in the most recent Fan Plan Championship Index and both teams even have a small shot at making the playoff field, according to the FPCI. UCF enters Week 8 with a 25.67% chance to win the conference and a 3.95% chance to make the playoff field. USF has a 21.62% chance to make win the conference and a 0.44% chance to make the playoff field. But when it comes to the national championship game, that’s when both teams fall out of the race. In the thousands of simulations run by the FPCI to determine the Week 8 ratings and projections, neither UCF or USF won any of the semifinal games when they were actually projected to reach the playoff field, giving both a 0% chance to make the national championship game in Atlanta. 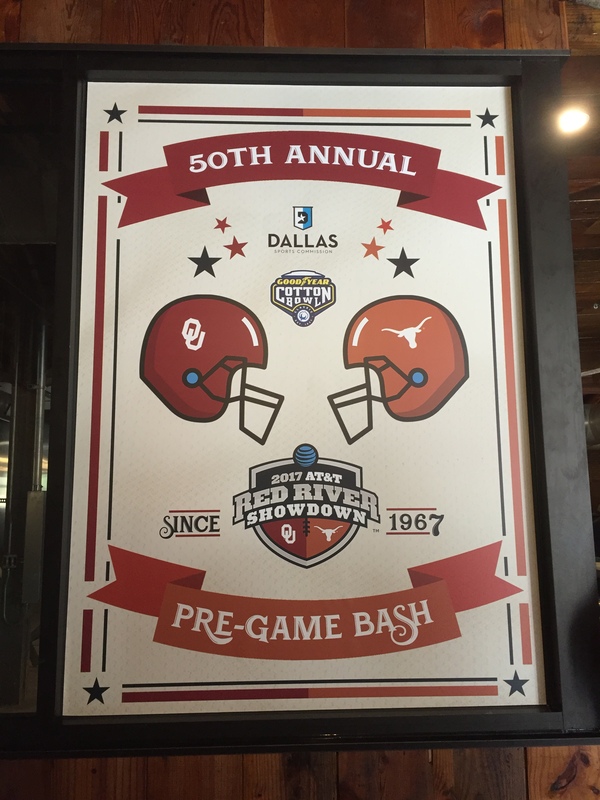 This was a poster from the Annual Luncheon that the Cotton Bowl sponsored before the most recent Red River Showdown between Oklahoma and Texas. 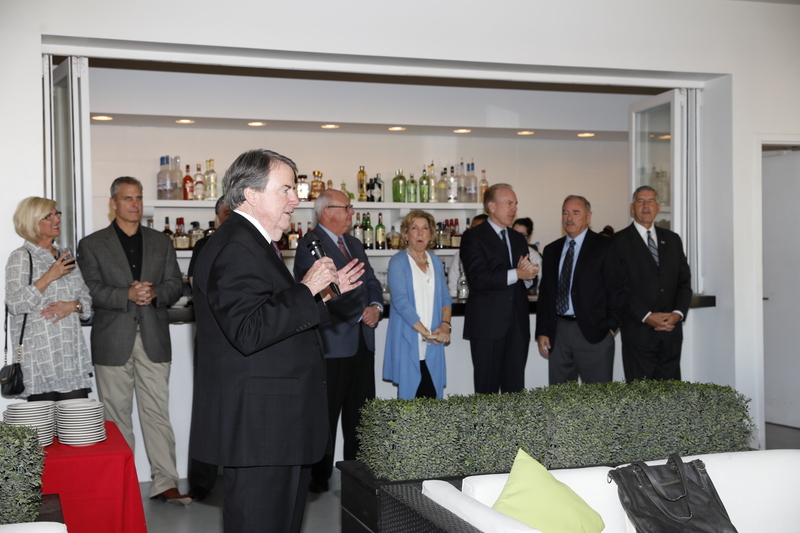 The luncheon has been held in Dallas for a half century when writers, broadcasters, sponsor and team officials gather the day before the game at the Cotton Bowl Stadium.